Police have revealed 16 of the 17 people injured in yesterday’s crash between a double decker bus and a lorry on the A47 at Thorney Toll were from Peterborough. Officers added that six of those had received serious injuries. 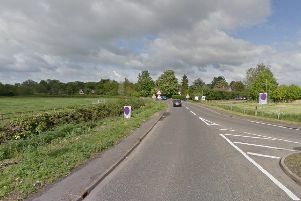 Two people, one from Norfolk and one from Kettering, Northants, were killed in the crash. Police have named the pair as Michael Elcombe, 45, of Cley Road in Swaffham, Norfolk, and Brian Chapman, 76, of Cherry Road in Kettering. The final person injured in the crash was from Hunstanton in Norfolk. The circumstances of the collision are being investigated, but no arrests have been made. Mr Chapman was well known in Kettering having served as a verger at St Peter and St Paul in the town centre. He was making a weekly trip to a market in King’s Lynn, when he was killed. The pensioner, who was known for his collection and love of teddy bears, previously worked at the Royal Mail. Rector David Walsh, from the same church, led with the tributes to him on Facebook, saying: “Sad and shocking news for our church community here in Kettering. “Our verger for the past few decades, Brian Chapman, was killed earlier today in a road traffic accident. “He was in a bus on his way to King’s Lynn. It’s hard to imagine St. Peter & St. Paul’s Church without him. “We will gather together at our 12.15pm eucharist on Wednesday to remember him and do so again at our Patronal Eucharist on Sunday. “Dear Brian. May he rest in peace and rise in glory. “It’s the small things that get you. “Brian & I had been holding next Thursday in our diaries for weeks for me to take him out for lunch. Damon Wellington Long added: “Brian will be soooo badly missed. “I’ve known Brian ever since he was the verger at PandP and have so many memories. “To anyone who didn’t know him and took a first glance at him you’d be mistaken in thinking he didn’t really want to be sat at the back of church, or that he was a bit grumpy looking. “But very close to the surface was a lovely, hard working, chatty and kind man who loved our Church, his Town of Kett and his bears! “Maria Chapman also wrote: “What awful, awful news. He will be much missed by many. I was so very fond of him. “We talked together about his weekly trips to the market in Kings Lynn. Mr Elcombe, worked for First Buses in King’s Lynn, Norfolk, and lived with his wife Sonia, a care assistant, in Swaffham, Norfolk. His colleague Jonny Whitaker paid tribute to him on Facebook, saying: “Thinking about the driver and family of today’s fatal bus crash in Guyhirn. Kieren Tabor added: “Nice guy, good work mate, always had time for you. It’s a real shame, a real shame”. The collision is thought to have occurred when the articulated lorry turned right out of its depot on to the busy 60mph A-road. Inspector Jamie Langwith, for the Beds, Cambs and Herts Road Policing Unit confirmed the lorry driver was questioned at the scene but has not been arrested over the crash. He said five other passengers suffered serious injuries, including broken bones and head injuries, while several other people on board were also wounded. No children were on board the bus at the time of the crash. The side of the lorry shows the logo of Brett’s Transport, having come from the depot just metres off the A47 where the crash happened. The bus involved was a First X1 Excel service which was travelling between Peterborough bus station and Wisbech bus station, at the time.